Over the course of the mission trip there were many challenges beginning with crowding and confusion in the clinics as well as the workload for the medical providers! Management was improved by placing a nurse at the front door receiving area and having a nurse practitioner for primary staffing of the surgery clinic. There were also two major infrastructure problems. Electrical supply issues were critical due to the fact that one of the generators failed and the other one was inadequate to provide power to both the medical clinic and the hospital. The hospital rented a large generator to provide power to the hospital including the autoclaves and the air-conditioners in the operating room. In addition to the electricity, the autoclave was problematic because there was a lack of ongoing maintenance and biomedical technicians in Haiti who are familiar with that particular type of autoclave. Since this mission, a new autoclave has been purchased and plans are being made to purchase a new generator. 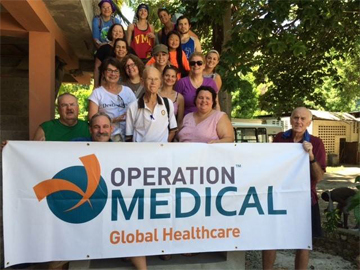 Patient Procedures:The team performed 150 surgical procedures during the mission trip which included circumcisions, excisional biopsies, hydrocele repairs, hysterectomies, lipoma removals, uterine myomectomies, and an assortment of minor procedures.